. 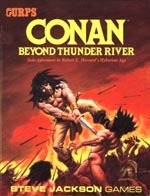 . . And only the mighty Conan stands in their path! When the army of Aquilonia marched across Thunder River and into savage Pictland, the tribes of the Picts were driven away. To secure his rich new territory, King Numedides built Fort Tuscelan, a powerful outpost meant to keep the barbarian Picts from striking back. For the Picts have united behind a sorcerous leader: the great witch-doctor, Zogar Sag. Even now, he is raising a vast Pict horde to crush Fort Tuscelan. 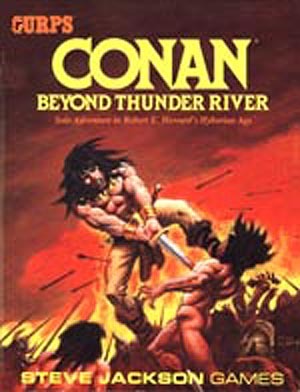 You are Conan of Cimmeria, commander of the scouts at Fort Tuscelan. Can you stop Zogar Sag and his army? Adventure – a 560-entry solo adventure for Conan of Cimmeria, or your own character. There are dozens of alternate paths . . . you can play over and over and never have the same adventure twice! Conan Character Sheet – the bold Cimmerian at age 40, as an officer in the service of Aquilonia. Maps – Northwestern Hyboria, showing Aquilonia and Pictland; Conajohara Province, between the two nations; and several combat maps, for the battles in this adventure. Monsters – nine fearsome Hyborian animals for your campaigns. All of Aquilonia is depending upon you to save the land Beyond Thunder River! The adventure continues against the Pictish hordes and the great witch-doctor, Zogar Sag, in GURPS Conan: Moon of Blood. Explore the haunted ruins that lie on the Zarkheba River in GURPS Conan and the Queen of the Black Coast.